Appearing before the joint committee on privacy and injunctions yesterday, Martin Clarke, the publisher of Daily Mail website Mail Online, shared some interesting comments on digital media, in reference to privacy, regulation and general approaches to journalism in a digital world. The latest results from the Audit Bureau of Circulation (published in December) showed the Mail Online continued its lead ahead of other audited UK news sites with almost 85 million unique browsers in November. If we were publishing really unpleasant, intrusive stuff our readers wouldn’t like it. One of the beauties of the internet is the feedback you get from your readers is pretty much instant in two ways. First of all, you can see in real time who’s reading what stories on your homepage … that immediately tells me which ones they’re interested in. Secondly, we have the comments facility and readers aren’t slow to let us know when they think we’ve been unfair or unpleasant. Quite often I’ve changed tack on a story, or the headline on a story or dropped a picture because of things readers have left in comments. That’s the beauty of the internet, the interaction between you and your readers is that much more immediate. If there were no privacy law no I don’t think it would make that much difference. You are dealing with an industry that faces big commercial challenges going forward. Digital is how newspapers are going to have to make their living, the economics of the internet are such you probably have to make big chunk of that living abroad. Any further regulation might compromise that, and then quite frankly we won’t really have an industry left to regulate. … You think of the internet in chunks, press, bloggers, tweeters, but from the consumers point of view that’s not how they consider it. It’s an endless continuous spectrum that starts with what their friends are saying on their Facebook pages, what some tweeter might be saying, to a story they link to in a tweet, then go back on to Facebook page and comment … Pretty soon all those commenting systems are going to be bolted together. Where do you draw the line, where do you say right this bit of the internet is going to be regulated and this bit isn’t? … We’ve had to wake up and deal, embrace a new reality … The internet is a great way to distribute news, it means newspapers are now back in the business of breaking news … alongside TV and radio and the people who had taken that privilege away from us. It’s gratifying as a journalist to be part of that. Equally it’s brought some negatives …. You can’t turn back the tide, we can’t say stop the internet world we want to get off. The reason it’s different from the Daily Mail is because it’s a different market … I’m operating in a digital market where we do get feedback from the readers, I can see in real time what they’re really reading rather than what I might think as journalist they should be reading. In the digital world if you don’t listen to your users, if you don’t involve them, if you don’t listen to their tastes, than you’re dead. We don’t follow that data slavishly, that’s where I come in, it’s my job to mediate the light and the shade. So that’s why it’s different from the Mail. Equally we do more showbiz…we do vastly more science, we do more political commentary, we do more foreign news because we’re not limited by physical space … It goes back to the point I made right at the beginning, if you’re going for scale you can’t just fit in a niche. You can’t say “we’ll be in the red-top end, or the middle-market or the broadsheet end”. Niches aren’t big enough on the internet to survive, so you have to be a much broader church. 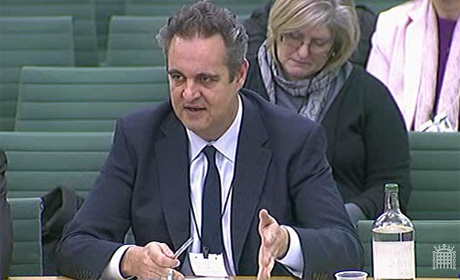 You can watch the session in full on Parliament TV and hear from others who appeared before the committee, including Edward Roussel, digital editor of the Telegraph Media Group and Phillip Webster, editor of Times Online. This entry was posted in Editors' pick, Online Journalism and tagged community, digital journalism, Mail Online, Martin Clarke, privacy, regulation on January 24, 2012 by Rachel Bartlett. This entry was posted in Events, Traffic and tagged editorial director, Journalism.co.uk, Mail Online, Martin Clarke, newspaper web metrics, Society of Editors, web metrics on November 10, 2008 by Laura Oliver. This entry was posted in Events and tagged Alan Rusbridger, Carolyn McCall, Hugh Carnegy, Ian Squires, Laura Oliver, Malcolm Pheby, Martin Clarke, Nottingham Evening Post, Paul Dacre, Pete Picton, Society of Editors, Sun Online, Twitter on November 10, 2008 by John Thompson. Mail Online last week became the UK national newspaper website receiving the most monthly unique users. But it gets a lower percentage of its user from the UK than any of the other newspaper websites so says the Media Guardian – gleaning a load of traffic from international celeb news and matching itself against other sites that aren’t just UK newspaper afilliations. Does this render the ABCe measurement of newspaper against newspaper redundent? As newspapers will be matching different parts of their website against other specialist publications. This entry was posted in Editors' pick, Traffic and tagged BBC, editorial director, google, guardian, Mail Online, Martin Clarke, The Guardian, United Kingdom on June 23, 2008 by Oliver Luft.